Have you ever tried to clean an outdoor patio table? 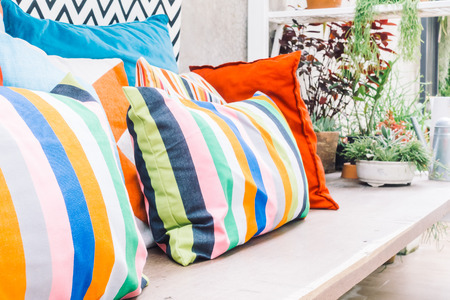 Turn patio cushions regularly for even wear and sun exposure; remove stains with an enzyme cleaner. It's an exercise in futility. You wipe it, it dries, and streaks multiply. The same type of challenges arise with other outdoor patio furniture. You're battling Mother Nature here, after all. Whether your outdoor furniture is wicker, wood, aluminum, or teak, here's how to clean patio furniture to keep it looking good for the season ahead. Most outdoor furniture cushions have synthetic covers and polyester fill and are designed to withstand the elements. Still, they could probably use some help if you'd like them to last for the long term (or at least a few seasons). Here's how to clean patio furniture cushions with polyester fill. Turn patio furniture cushions often for even wear and sun exposure, just like you do your couch cushions. Avoid getting sunscreen on patio furniture cushions. Hose off spills or sunscreen smears immediately. For stubborn stains, use a spray enzyme cleaner. Set the cushions on their ends in the sun until they are completely dry. If you detect mildew, put the cushions on an outdoor surface. Saturate with a solution of 1 cup of bleach, 3 gallons of warm water, and 1/4 cup of laundry detergent. Let the wet cushions sit in the sun for several hours. Rinse. Let them dry in the sun for several days if necessary to dry. Be sure to wash away any remnants from the outdoor season before storing cushions for the winter. Set stains are nearly impossible to remove. Store clean patio furniture cushions in plastic bags for the winter. The problem with "outdoor living rooms" is that they get dirty a heck of a lot faster than the indoor ones. Fortunately (or maybe wisely), outdoor furniture is constructed to take abuse - and soil. If your outdoor furniture is near a pool or spa, clean it once a week by rinsing with a garden hose, and using a sponge to work off any dried on blights. Allow to dry in the sun. Chlorine can damage most finishes, so your goal is to make sure it doesn't have time to set on your furniture. Wash aluminum patio furniture with mild liquid detergents; rinse and dry. Coat aluminum patio furniture with an automotive wax every six months. Be aware that sunscreens can stain aluminum and many other kinds of outdoor furniture. If you're wearing sunscreen, protect the chair you're sitting in with a towel. Resin patio furniture doesn't require much care or cleaning. Yay! Just wash it with a mild soapy solution, hose it off, and towel dry. Avoid products with ammonia coming into contact with your resin patio furniture. Instead use a diluted bleach solution for resin patio furniture stains. Follow by polishing resin furniture with car wax to give it a clean, shiny finish. Teak patio furniture is popular because it weathers so well. Do not use teak oil on outdoor furniture, however, because it will act as a magnet for dust, dirt, and anything else that will stick. To clean, buff teak with a mild soap solution and a soft brush. Rinse well. Keep teak patio furniture in the sun, as dampness will cause teak furniture to mildew. Clean wicker patio furniture once a year unless you have spills (ha!). For natural wicker, first tip the chair to one side and vacuum it well. Then wash with a stain removal solution of mild detergent and water, using a toothbrush to get at those hard-to-reach spots. Rinse clean with a garden hose. Towel wicker dry, and let sit for 24 hours before using. Polish wicker furniture with furniture polish occasionally. Natural wicker will rot in the sun, so place it in a shady spot, or beneath your umbrella. Never cover wicker with plastic because it will trap moisture and encourage mildew. Wash synthetic wicker furniture in soapy water, and then rinse and dry. You can polish it with a spray-on polish. 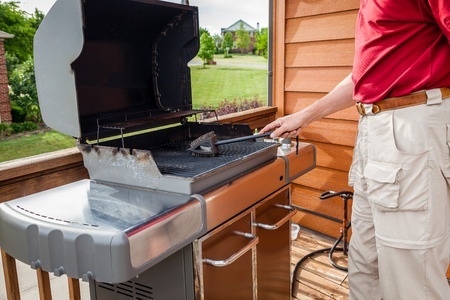 Wash wood patio furniture regularly with a mild detergent using a scrub brush. Store it indoors over winter if possible. Clean wrought iron furniture with soapy water; rinse and towel dry. Wax or polish it twice a year. Touch up any rust spots immediately. During the winter, either bring wrought iron indoors or cover it. Cotton hammocks soak up water like a sponge. When you first bring them out in spring, spray them with a water repellant to minimize water retention. To clean hammocks, lay them flat and scrub them with a solution of hand dishwashing detergent in warm water using a nylon scrubber. Rinse and clean the other side. Rinse again, and hang to dry. Outdoor tables are really hard to clean flat. The trick to cleaning an outdoor table is to turn it on its side (very carefully, if you're dealing with glass), and hose it down first. Then wipe it off with a sponge dipped in soapy water. Hose again. Then wipe dry. Clean patio umbrellas and dry in the sun prior to putting them into storage. To really refresh a patio umbrella, take it apart and put the top part back into the stand so that it's within reach. Crank the umbrella open and wash it with a liquid dish detergent solution and a sponge. If your umbrella's vinyl, use the detergent made for convertible car tops. It works wonders on these sun-beaten skin-savers. Dry your patio umbrella open in full sun for a day or two. Never put patio umbrellas away even slightly damp. That's a recipe for mildew. Now that you know how to care for your patio furniture, you can take care of your outdoor investment easily!